This tours national reserved tambopata sandoval lodge 4D begins in Puerto Maldonado, we will go to the National Reserve of Tambopata, sailing along the Madre de Dios River, we arrive at Puerto Sandoval and pass through a control, then we resume the boat trip to reach the Sandoval Lake mirror , where we will observe magnificent species of birds and mammals. We will travel by boat across the lake to observe giant otters and unique species of monkeys and macaws in trees. Then we will visit the palm trees to observe scarlet macaws and parrots later we will go to see the ceibas, giant trees, and in search of alligators and enjoy beautiful sunsets. 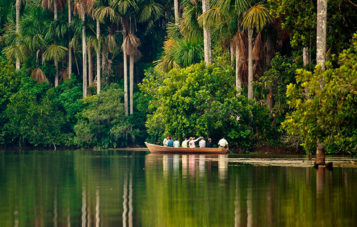 This 4-day adventure begins in Puerto Maldonado, we will go to the National Reserve of Tambopata, sailing along the Madre de Dios River, we arrive at Puerto Sandoval and pass through a control, then we resume the boat trip to reach the Sandoval Lake mirror , where we will observe magnificent species of birds and mammals. We will travel by boat across the lake to observe giant otters and unique species of monkeys and macaws in trees. Then we will visit the palm trees to observe scarlet macaws and parrots later we will go to see the ceibas, giant trees, and in search of alligators and enjoy beautiful sunsets. Upon arrival to Puerto Maldonado, at the airport or bus station, one of our local guides will meet you and will transfer you to our office located in downtown where you will be able to re-pack and to leave the baggage that you won't need for the tour. We will start from the Tourist port (Puerto capitania) from where a motorized boat will take us 45 minutes downstream to the Sandoval port, the entrance to Lake Sandoval located inside the Tambopata National Reserve. To get to Lake Sandoval we will have to walk 3 Km. or about one hour (muddy in the wet season) to arrive at a small port from where we will take a rowing canoe. About half an hour of rowing will take us to our Lodge. Arriving at the lodge we will have a warm welcome with a flavorful tropical juice, and after a brief introduction to the lodge we will be able to take a rest in one of our comfortable rooms. Equipped with a flashlight or head lamp we will take a night walk in the forest to search for the night monkey (Musmuqui), frogs, snakes and insects that are active during the night. We will return to the Lodge for dinner and to spend the night. 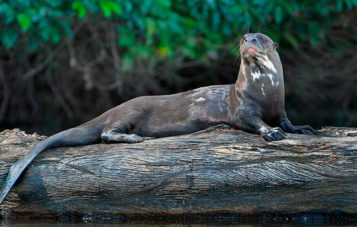 Very early in the morning we will row around Lake Sandoval in a wooden canoe trying to see the giant river otters (the biggest in the world), one of the most important protected species in the lake and considered flagship species. 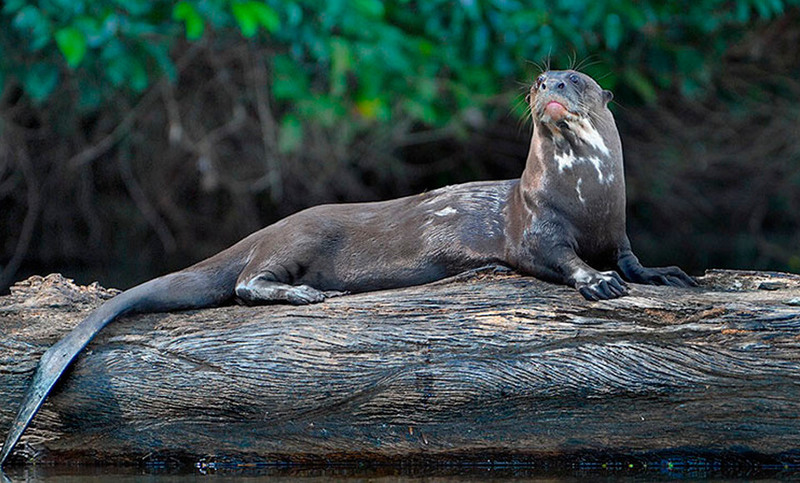 Giant otters live in small and territorial family groups and feeds on fish around the lake in the early morning. They can eat up to 4 kilos of fish a day. We will return to the Lodge for the breakfast and a brief rest. 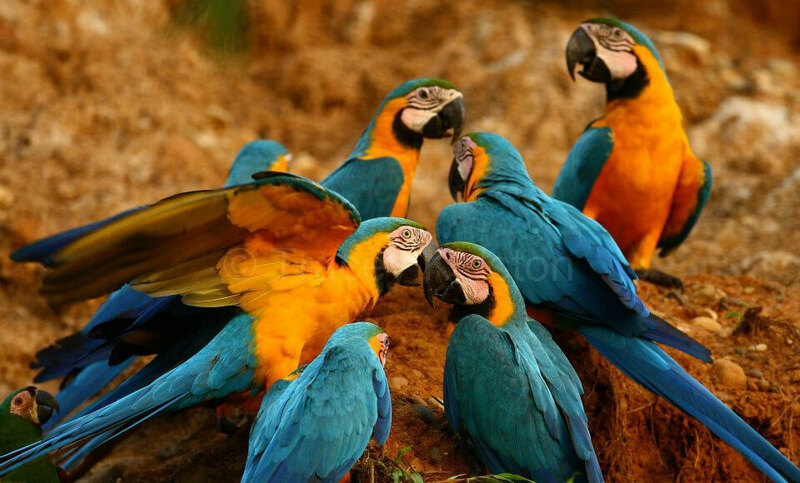 We will leave the lodge and we will go for a walk in the terra firme forest learning more about the medicinal plants and diurnal mammals such as monkeys, wild cats, peccaries and birds like toucans and macaws. We will also learn about the ecology of the Brazil nut tree or chestnut tree that is considered an umbrella species, because it helps to protect other flora and fauna of the region. We will return to the Lodge for lunch and nap time. 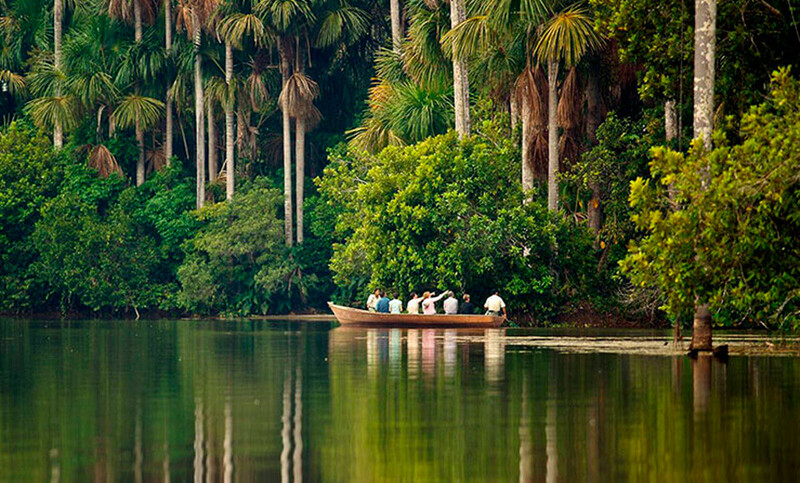 In the afternoon, we will take the canoe around Lake Sandoval again, this time to look for monkeys (cappuccinos, squirrels, and red howler), herons, kingfishers, cormorants, and shanshos that live and feed in the forest around the lake. 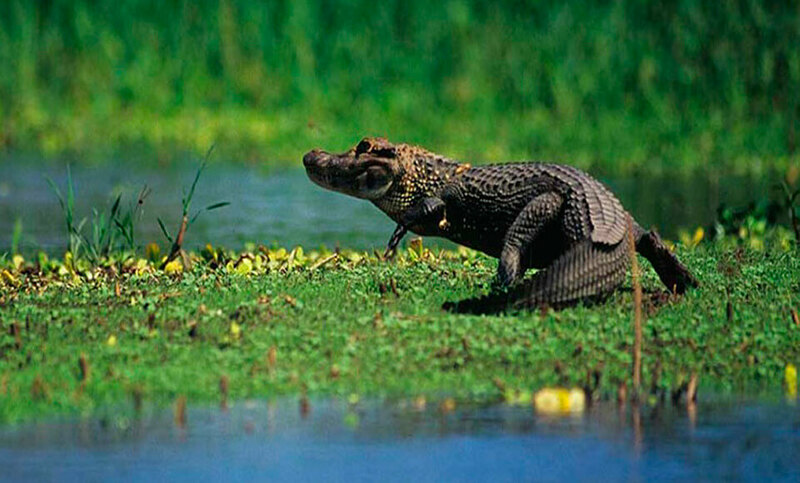 In the evening on our way back to the lodge, using our flashlights we will be able to see the reflection of the eyes of the black caiman that usually hunt at night along the shore of the lake. 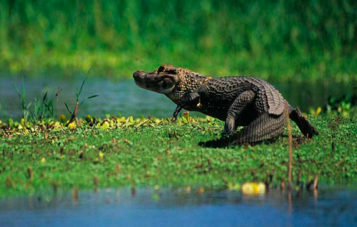 We will approach them to take photos and we will talk about their natural history. We will return to the Lodge for dinner and to spend the night. Day 3. - Lake Sandoval - Palms Clay lick - Flood Plain Forest - Tower. We will get up very early to cross the lake Sandoval and to walk about 20 minutes to visit the Collpa de palmeras or palms clay lick. 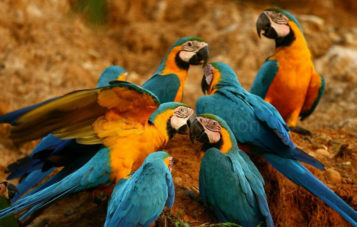 This is a special place where different species of macaws (blue and yellow, scarlet, red bellied, chestnut fronted) and parrots (yellow crowned, mealy, white bellied) meet to eat the dead wood of the palms trees that is rich in salts and minerals (calcium, sodium, potassium, aluminum, magnesium and iron). This is a very important mineral supplement and helps these birds with digestion and to counteract the bad effects of the toxins that they ingest feeding on un-ripe fruits. We will return to the Lodge for the breakfast and a brief rest. We will get ready cross Lake Sandoval by canoe to go to the floodplain forest. We will walk for approximately 2 hours and will see big trees more than 200 years old, like the Shihuahuaco (iron tree), Lupuna (kapok tree) and oje (medicinal ficus tree); trees that grow only in this type of forest. We will return to the Lodge for lunch and nap time. In the afternoon we will again explore the lake by canoe, but this time we will visit a 12-meters high tower that is located between the limit of the touristic area (2 Km.) and a refuge area (1 km). From the tower we will watch the sunset. We will return to the Lodge for dinner and to spend the night. Day 4. - Lake Sandoval - Adventure - Puerto Maldonado – Airport. Very early after breakfast we will leave the Tambopata National Reserve taking the same way back to the entrance at the Sandoval port on the Madre de Dios River, from where will be taking our boat to return to Puerto Maldonado. After re-packing your luggage, the guide will take you to the airport. Hiking shoes or rubber boots.